For more than 20 years, America's leading companies have trusted Tripp Lite's Isobar Premium surge and noise suppressors to protect sensitive computer, networking and telecom equipment. With more than 18 million satisfied customers, the Isobar remains the world's #1 selling premium surge suppressor. Loaded with a generous combination of high quality components, near indestructible all-metal case, unique noise filtration system and built-in single line phone suppression for modems, the Isobar/Isotel series offers the highest level of protection attainable in a multi-outlet strip. Robust surge suppression circuits with sine-wave tracking offer extreme levels of protection against the heaviest surge conditions exceeding IEEE 587 category A & B specifications and reducing 6,000V test surges to harmless levels under 35 volts. Isobar's unique protection system combines large toroidal chokes, ferrite rod-core inductors, HF/VHF capacitors and multiple layers of metal oxide varistors into exclusive isolated filter banks that remove EMI/RFI interference, even noise generated by other pieces of connected equipment. 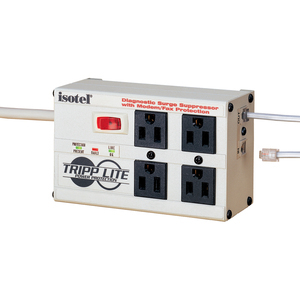 ISOTEL offers 4 outlets arranged in two filter banks to prevent system crashes, reboots and performance problems common as noisy system peripherals are powered off and on. Surge suppression rated at 3330 joules/92,000 amps offers network-grade protection. Widely spaced NEMA 5-15 outlets accommodate up to 4 large transformer plugs without blocking outlets. Pair of RJ11 jacks offer single phone line surge suppression for modems, fax machines and cordless phones. Includes 6 foot AC line cord with space-saving angled input plug and keyhole mounting tabs. Ideal for premium AC and phone line protection for personal computers with peripherals, network and CAD / CAM / CAE workstations, internetworking accessories, telecommunications systems, point of sale equipment, audio / video and home theater systems in any home, office or industrial application.